There’s that undesirable word again: hold. In this case it can’t be supplemented with anything else, because in order to get the bow from a resting position to the cello we have no choice but to hold it. Furthermore, we continue to hold it (if as gently as possible) once it is on the string. What we need to avoid right from the start is that urge to grip the bow, pushing the thumb against the frog and squeezing against the thumb with the fingers. Most people who pick up the bow for the first time without any instruction from a teacher or experienced player will approach it as an everyday task, closing the hand firmly around the frog without considering the impact this physical action has on the mobility of the wrist and even the elbow joint. This is not a problem when picking up a coffee mug, opening a door or opening a jar. All of these actions are over in seconds and often require a short burst of strength. 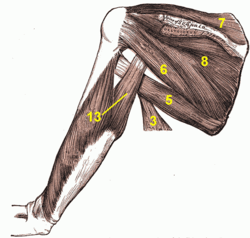 But if we maintain that level of tension in the hand and forearm for a longer duration we soon start to feel it. Furthermore, the fluid movements required of the entire arm for producing good, well-controlled sound on the cello will simply not happen if there is excess, unyielding tension in any of the muscles. It is not my intention to provide an overly prescriptive description of where to place each finger on the bow. There are many different schools of thought on this subject, and many readers will already have been given very detailed and specific instruction on it. All cellists settle on something that works best for them depending on the size and shape of their hands along with what they’ve been taught. Not only can it be desperately confusing when you’ve learnt one thing and someone comes along suggesting you do something quite different, I believe it shifts the focus from the important points of using the correct muscles, keeping the joints mobile and learning about fluid, balanced motion to battling with reshaping your hand and fingers, potentially building up the very tension you need to avoid. I do, however have a few basic but useful tips regarding your hand. Firstly, you need to look for a natural shape which allows for free, independent movement of your fingers and thumb. Let your hand hang loosely in front of you, palm and fingers facing downwards. Your thumb should be roughly behind your index finger. If you gently bend its first joint, the right corner of the thumb tip will be opposite the middle finger, which is where it will be most comfortable and flexible when holding the bow. Secondly, you need to be aware of and maintain sensitivity in each finger. As bow technique develops and the cellist works on what will become his signature sound, the sensitivity of his fingers plays a major role in making subtle changes and articulations. To become used to the idea of letting the bow hang out of the fingers rather than gripping it, it is very useful to practice with something of roughly equal width and weight, but much shorter length such as a marker pen, small bottle or container. Find the same natural relaxed hand shape (ensuring that the entire arm is engaged but relaxed and the shoulder is not pulling up) and place the object lightly between the fingers. There will be sufficient resistance between the fingers and object to prevent it from falling, but not so much that the fingers cannot feel its weight. 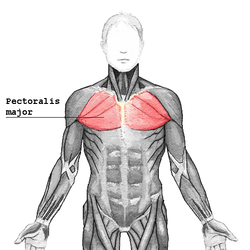 Maintaining a relaxed shoulder and supporting the arm from the muscles around the shoulder blade (the infraspinatus muscles – see image a below) and in the chest (the pectoralis muscles or pecs – see image b below), practice drawing a straight line in front of you using the second joints of your fingers. You should start with your arm at your side and your hand slightly to the left of your shoulder; and finish with your elbow joint more-or-less straightened. At no point should your shoulder come up. Getting used to this movement, thinking in straight lines and using the arm as a fluid unit will make life a lot less daunting when you first take the bow in hand and draw it across the string. It will also help you to overcome your very natural first instinct to grasp the bow rather than letting it rest on the string. An additional factor adding to the desire to grip the bow tightly is the understandable notion that one can’t get sound out of the cello without pressing the bow onto the string, which would require a strong grip. Many novice cellists use this approach with or without guidance to the contrary from their teachers. It serves them well enough – sometimes for several years. But they will always get to that painful turning point where they realise their bow technique can no longer progress, and they have to re-learn how to use the bow. I was one of those cellists, and it was not until I got to Music College, seven years after my first cello lessons, that I took that painful, time-consuming and hugely frustrating U-turn in my technical approach. I don’t recommend it! So how is it possible to get anything other than a whispery, insubstantial sound without pressing the bow into the string? The answer is simple, but takes time to put into practice: arm weight and leverage. When we start a down-bow the weight of the arm is on top of the string, making it easy to apply as much or little as we want. As we draw the bow across the string, that weight moves further and further away, making it necessary for the arm to act as a lever in order to maintain the same amount of friction between the bow hair and string. The entire movement is driven by the infraspinatus and pectoralis muscles, which support the entire arm and make it possible to maintain a loose hold on the bow from frog to tip. This is another reason why I emphasised the importance of free movement in the hips in my seat and support articles. Being able to move the torso from the hips makes it possible for the body to stay balanced on the point of contact, or point of friction between bow and string. A skilled cellist practically dances around this point with well-co-ordinated, fluid movements. Finally, it really helps to think of the bow as an extension of your arm. You may well have heard this before: many teachers find it a useful way to get their students to blend instrument, bow and body. Observe how much amazing movement is possible in each of your joints. Think of the join between your hand and the frog as another of those beautiful, flexible joints that enable us to use our bodies in diverse ways.